Gold futures logged their first increase on Monday after nine straight session losses dragged prices down by a combined 4.6%. Gold for April delivery gained $1.70, or 0.1%, to settle at $1,203.10 an ounce on the Comex division of the New York Mercantile Exchange. 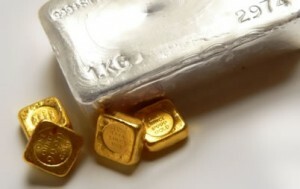 "Gold and silver prices ended a quieter U.S. day session slightly up Monday. Both markets saw minor upside price corrections and short covering from the shorter-term futures traders after they hit multi-week lows last Friday," Jim Wyckoff, a senior analyst at Kitco Metals Inc., said in a report. "Precious metals bulls are still in technical trouble amid the recent downdrafts in prices." Gold futures ranged from a low of $1,202 to a high of $1,210.90. They declined 2.1% last week, ending at their lowest point since Jan. 30. Snapping a four-session losing streak, silver for May delivery settled up 4.9 cents, or 0.3%, to $16.972 an ounce. Silver futures traded between $16.96 and $17.16. They tumbled 4.6% last week, and marked their weakest close since Jan. 26. April platinum added $3, or 0.3%, to $941.20 an ounce, ranging from $938.70 to $949.20. Palladium for June delivery tacked on $9.30, or 1.3%, to $754.45 an ounce, trading between $746.15 and $758.00. Both metals declined last week — platinum by 5.6% and palladium by 2.9%. Gold added $1.55, or 0.1%, to $1,204.20 an ounce. Silver added 13 cents, or 0.8%, to $17.02 an ounce. Last week, London metal prices registered losses totaling 2% for gold, 4.4% for silver, 4.6% for platinum and 0.5% for palladium.